We might get some idea of the direction in which the Sikyong mythology is heading from the sub-title of a documentary film being made by two European filmmakers, Christian D.Paehler and Maren Strenge. The project appears to have the approval and support of CTA and shooting in Dharamshala seems to have been wrapped up. 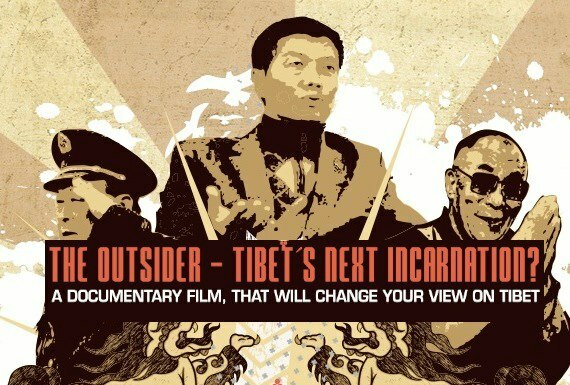 Lobsang Sangay is referred to in the title as The Outsider but more interestingly in the sub-title as “Tibet’s Next Incarnation?”. No objections or controversy has come up about this very suggestive sub-title, so perhaps we can conclude that this has been officially approved and blessed. This sub-title (even with the question mark) suggesting that Tibet’s new-found democracy could revert to a theocracy of some kind, is not at all reassuring. This misinterpretation, even deliberate misuse of the Dalai Lama’s suggestions and statements is the source of another major constitutional crisis in Tibetan society right now, creating an unnecessary and potentially malignant division within the exile community. On September 6th last year, eleven Dharamshala based political factions and coteries (from the religious right) gave a press conference at the Bhagsu Hotel where they condemned the Tibetan Youth Congress (TYC) and “some individual Tibetans” for “hurting the Dalai Lama’s feelings” by accusing Him of closing down the government-in-exile. These groups were behind the so called “public” demand for shutting down the Tibetan Youth Congress. 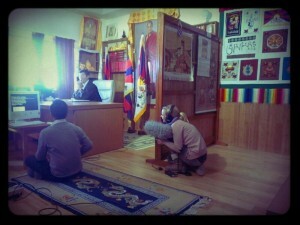 They have also issued threats of violence to “individuals” in Tibetan society known for their pro-independence views. 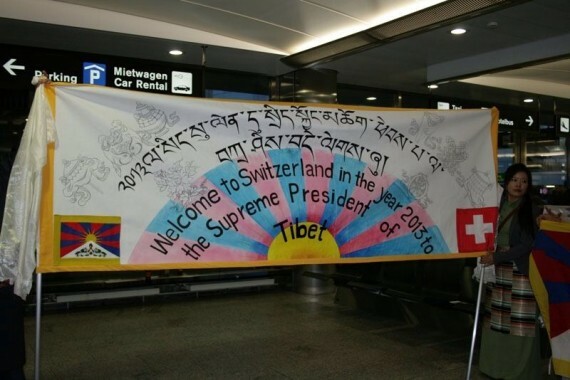 “However, when questioned by reporters, the NGOs said they did not have any direct evidence that the TYC had made any statement to this effect, but rather that they were referring to a speech made by His Holiness the Dalai Lama” (on August 3, 2012 at a teaching in Ladakh). 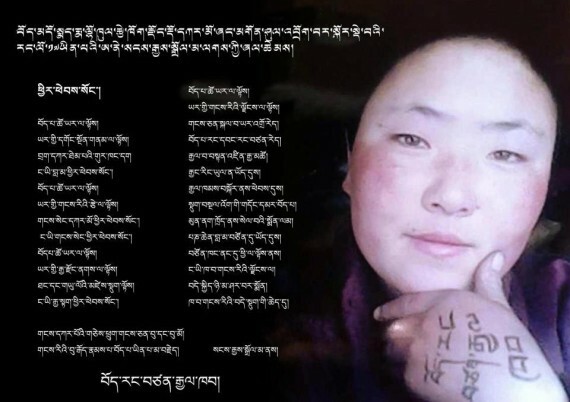 Sangye Dolma, 17, set herself on fire on 25 Nov, 2012, at Dokarmo. The message on her hand reads "Tibet an Independent Nation"
In its March 10 statement this year, the Tibetan Parliament-in-Exile warned the Tibetan people not to resort to speaking, writing articles, and propagating information without any sense of responsibility and instead to direct their efforts at achieving “the common desires” of the Tibetan people. “Common desires” being their euphemism for the Middle Way Approach. Earlier the Sikyong had condemned some unnamed people who, “either knowingly or unknowingly”, were creating divisions among the Tibetan people. Speaker Pempa Tsering similarly attacked “baseless claims made by a small group of Tibetans causing distress to His Holiness the Dalai Lama”. Other cabinet ministers as Gyari Dolma had also publicly condemned critics of the establishment. I feel that it is absolutely important for His Holiness to understand that his true political legacy – in an ultimate sense – is not the Middle Way Approach or even his advocacy of non-violence for which he received the Nobel Prize. His true legacy, one for which he will be gratefully remembered by His people, is his introduction of democratic governance to exile Tibetan society, no matter how limited or flawed it has been, as I have described in some of my previous writings. It is also my sincere belief that the future Tibetan leadership and even the kind of society that the democratic process will bring about, will have the knowledge, skill and dynamism to bring about the successful resolution of the Tibet issue. It is hence important for His Holiness to make sure that his legacy of democracy is not discredited and that His idée fixe, the Middle Way Approach, does not become the principal cause of its failure. The decision to step down from power was, of course, entirely His Holiness’s own. Nonetheless, retiring from the position of supreme authority He had held his entire life might have been for Him a little unsettling in the beginning, and the cause of some anxiety and even a second thought or two.